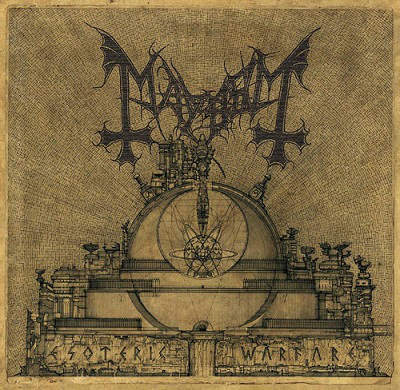 I have never been a huge fan of Mayhem, sure loved the old classics like Chainsaw Gutsfuck and the mega opus Freezing Moon, and of course the extensive lore and fascination with bands history. But I will be the first to admit that I don’t necessarily care too much for their music. I say this all because I was surprised when I listened to their new album Esoteric Warfare. To me this is a very unique and unparalleled in concern to their older material. I know this is of the utter most blasphemous diatribe to be uttered, considering the elitist kvlt vibe about this, and trve black metal. But I like to consider myself somebody who is grounded in reality, and does not put myself into a corner when it comes to music. The album just plays out with odd sounds and melodies, sometimes simple strings played out to some ominous background whisper. I especially like the track Trinity, which includes a sample from J. Robert Oppenheimer, giving his speech which includes the lines, “Now I am become death, the destroyer of worlds…”, chilling speech and the songs just commemorates the destructive and hell bent nature of war and atomic bombs, wiping out cities. The negative nature just find itself so appealing. Then you hear sirens amidst the song, just to add an uneasy feeling. The overall sound is really hard to describe, it’s often odd time signatures, multiplied by the agonizing screams of the vocalist. Little distinction and direction, just a off the wall, wallop bashed against the wall. I have given this album a considerable amount of listens, and it still has appealing value to me. It’s just ominous and chaotic blend of mismatch in sounds. Esoteric indeed.